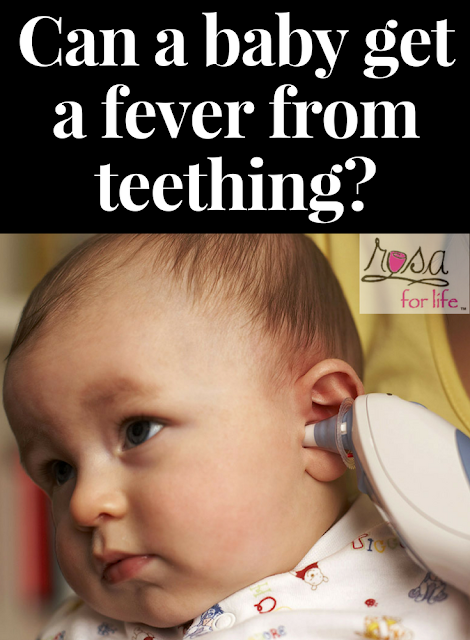 Can a baby get a fever from teething? Parents know firsthand that teething can make your baby cranky and even cause a mild fever. However, any temperature above 101 degrees is likely from an infection rather than teething. ... "If your infant is experiencing such symptoms, or the irritability is excessive, you should touch base with your pediatrician." When your baby's teeth start to poke through the gums, usually between 4 and 7 months, the signs shouldn't be hard to spot. ... Teething can raise your baby's body temperature, but only slightly. Any fever over 100.4 F is a sign that your child is probably sick. According to the authors of the study, this distinction is important because if a child develops a true fever (higher than 100.4 degrees Fahrenheit), assuming that the cause is teething may lead doctors or parents to miss possible illness or infection that requires treatment. He was getting 103 fevers for the past 4 days. ... I think the doctors say they're not related because then every time someones child ran a fever they would disregard it as teething when it's possible it's ... I'm taking him to the dr. tomorrow just to be safe, with all this flu talk I don't think we can be to cautious.